I realize I’m a little late to this game. Destiny, for those not in the know, was created by the company that spawned the incredibly popular Halo series. It came out in September, 2014, but I just got around to playing it (thanks to the generosity of my sister-in-law’s boyfriend) a few weeks ago. I’ve only played for a few hours, but I’ve already noticed some story elements that seem awfully similar to a bigger story I’ve been talking about here on EpicTheology. Now, if you haven’t played the game, don’t worry. The info I’m sharing comes from very early in the game, so it’s not really spoilers. It’s more about backstory, a story I think is fascinating. Let’s delve in. In the world of Destiny, humans of the near future stumble across an entity known as The Traveler while first exploring Mars. This semi-divine being brings humanity into a glorious age of exploration, expansion, and miraculous health. However, this Traveler is opposed by The Darkness, an evil force that wages war upon The Traveler and humanity, destroying much of what we had created. Before the game begins, the Traveler lies dormant, with the people awaiting its return. Perhaps it’s because I look for these things, but the parallels to the story of Jesus are striking. Jesus, a divine/mortal being came to earth and proclaimed the beginning of a glorious era, the Kingdom of God. He brought healing and peace, and in His Name, humankind expanded across the world. However, the enemy of this Christ is also waging a war upon God and His Creation. Jesus was killed by those who opposed Him, and we now await His return. As we do so, we must fight against injustice, hatred, temptation, and the forces of darkness. The important missing link here is Jesus’ resurrection, but sine Bungie has a ten-year plan for this game, it’s not beyond imagining that the Traveler might awaken/return to fight against the Darkness. Beyond the overarching narrative, some of the smaller details seem to have parallels with the Christian belief system. 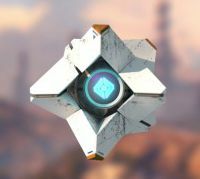 For example, just before the Traveler became dormant, it sent out pieces of itself, called Ghosts, to reawaken dead soldiers with the capability to harness Light. They serve as guides and companions for the player characters throughout the game. In a similar fashion, Jesus and the Father, after Christ’s ascension, sent the Holy Spirit (or Holy Ghost…), a member of the divine Trinity, to awake those who would become part of the Kingdom of God. Those who were previously dead are brought back to life and given a mission to serve and worship the giver of all life. In Destiny, the players fight against the Darkness for the cause of Light. Christians are called to fight against the encroaching Prince of Darkness for the one who is the True Light. While I understand many have issues with violence in video games, I believe that the underlying story in Destiny is one that we can hold up as a bridge to the faith. Those who fight against the Darkness should stand bravely together. Have any of you played Destiny? If so, let me know if you see any more similarities that I’ve missed. If you disagree with the entire concept, chime in as well. Let’s talk about the places our story and video games collide!